La fiesta de los Reyes: part two. Today was why we came to Barcelona in early January. Emily’s partner’s family invited us to share in today’s traditional family gathering. How could we refuse? We’ve just had the best of days, with about thirty members of Miquel’s wider family. We’ve muddled through in Spanish, in English, in French. We’ve watched with pride Emily’s integration into this loving and close family group. Lots of eating, lots of drinking. 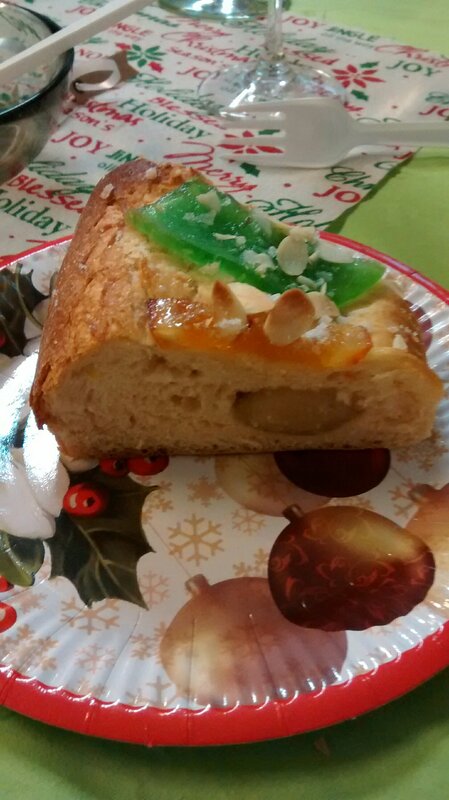 Then everyone had to share in eating the traditional Three Kings cake, el roscón de Reyes. We’d all chucked five euros into the pot, and the person who found the little pottery king in their slice won the lot – all but five euros. Miquel won that, for finding a bean in his slice. Then it was charades. Can you imagine? But this little detail made us laugh. If you need to indicate that the title you’re miming is in English, you drink from an imaginary cup of tea whilst crooking your little finger …. A very good day has been had by all. Thank you, Miquel’s family, for making us so welcome. How lovely! All of it. You describe the event so amusingly, I could almost feel I was there. You would have been made very welcome. This is a lovely happy story for the start of the new year. Thanks for sharing it! That does sound like a great day! I always feel daunted by these great big gatherings until they get under way, and then I get caught up in the fun. The cake tradition has a counterpart here–at Mardi Gras, it’s traditional, in New Orleans, to have a King Cake with a tiny plastic baby king cooked in. The one who gets that piece of cake only gets good luck, though, I think . . .
Oooh, doesn’t the plastic melt in the oven? I’ll stick with pottery and break my teeth instead! Sounds like a super event. I read your post on our return from a Fête des Rois dinner with French friends and other local francophones. We also had a great time and no teeth were broken in the figure in the galette. Now I count that as an achievement! We still have the one and only fève I ever won: he’s a little sapeur pompier. I must pop him in a galette des rois one year. What a lovely family occasion and so nice to be included in it! It was a lovely day. One we’ll always remember. How lovely. I remember arriving a day early for my Spanish language course in Barcelona and discovering to my horror it was their celebration day. 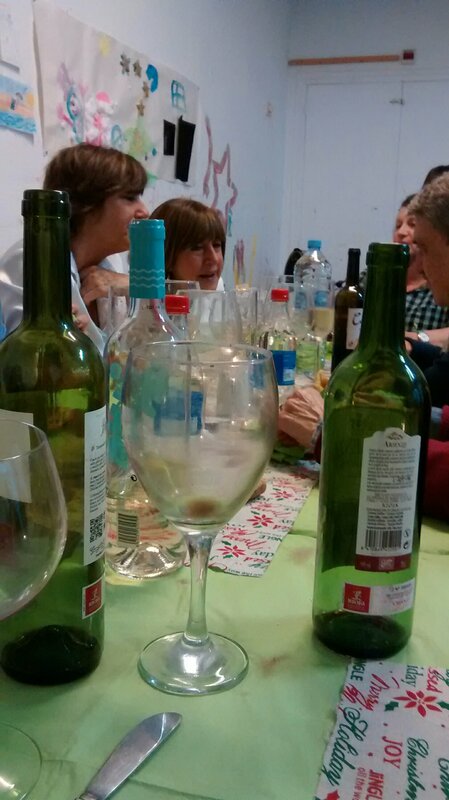 I was lodging with a family and inadvertently gate-crashed their Christmas, with them very kindly and unfussily making space for me round their table. I got the bean (I think it was the bean) in my slice of cake which apparently meant I was supposed to buy the following year’s cake. Happily, they let me off. Lovely people, the Catalans. Ah, that ‘your turn next’ tradition holds in France too. And yes, Catalans are lovely. Especially my daughter’s lot! Sounds like a very special get together with your daughters ‘intended’ and the family! The blessings of a large and loving family that honour traditions. I do love the drinking tea imitation – what do they do for French titles? I have no idea. It didn’t come up. An interesting question though. Yes, it was a wonderful day. Next Next post: Bullfighting is dead. Long live retail therapy.